Sometimes saddlebags aren't enough or I just want to leave them off. Installed Givi SR4114 Rear Rack Adapter from Amazon https://www.amazon.com/SR4114-Adapte...eywords=sr4114. Added scrap aluminum strap to connect both pieces. Total $33.95 for rack. I used long bolts to attach strap so excess would protrude for bungee cords. Doug Just Doug and StormRider like this. Last edited by Zenner; 02-12-2018 at 06:45 PM. Nice. I want to make plate off this that cantilevers forward over the rear seat and is wide enough to strap my dry bag to. Future project. Nice. You could increase the surface though, things will push in this 'hole'. Nothing I carry has a soft enough bottom to droop into the opening between the cross members. I carry a large backpack, carry bag, or old Chase Harper expandable tank bag with no issue. However I do plan on either cutting a Dollar Store steel baking pan or using a piece of rigid supperware to cover the gap and make the support surface slightly bigger. That addition will give it a little more finished appearance if I ever ride without something on the rack. Love penny tech! You could also use a thick nylon cutting board instead of a baking pan; I've seen a few folks do that. Easy to drill/shape for mount holes or bungee cord/strap attachment points. Good suggestion. I'm always open to inexpensive and alternate ideas. Is there anything similar for the previous generation, without spend $100+? Avande, silviefox, Doug Just Doug and 3 others like this. You gave me an idea, so let me show the result. This gives better support for my nelson rigg drybag. Last edited by dddd; 04-19-2018 at 03:49 PM. Removed aluminum scrap and Walmart cutting board. 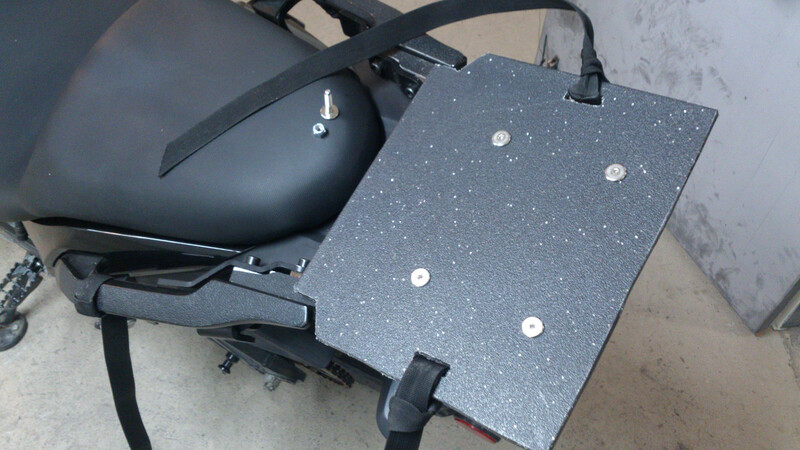 Installed Yescom 30L Motorcycle Top Box/Case/Trunk. Nice, well made, easily removable. AND it is big enough to hold my XXL HJC full face helmet. That came as a surprise. Not bad for $28.90. Did you have to do any adaptation to the top case plate or to the previous installed rear rack to fit it? Thank you very much for this post. Id considered a top box since I take the bike to the gym in the summer months twice a day. Its in a crappy neighborhood (welfare office in same parking lot so lots of foot traffic) always worried about my lid and tank bag when im working out. I dont want to take the lid into the gym because I already had my sena broken when someone knocked it off the top of a locker. Going to grab the extender and top box you linked, $60 is a good deal all in. No adaptation necessary other than drilling two holes. The front slots in the plastic mounting plate lined up with holes in the brackets. I had to drill two holes in the brackets to use the rear slots in the mounting plate. I wouldn't expect a plastic box to offer much protection in your case unless you remove it and take it into the gym. Unfortunately, luggage on motorcycles is just as likely to make thieves curious and all plastic containers are easy to open. Good luck, hope you can find a better location. Yeah sure you could break into in 5 seconds with a screwdriver. More of a out of sight out of mind thing. Just to keep the random crackhead from riffling the bag. And also would let me keep my gopro and sena on the helm so I wouldn't have to keep taking that stuff off and on. when I lock it to the bike like I do now. And for camping or fishing ( or fishing while camping lol) you have a cutting board right there.